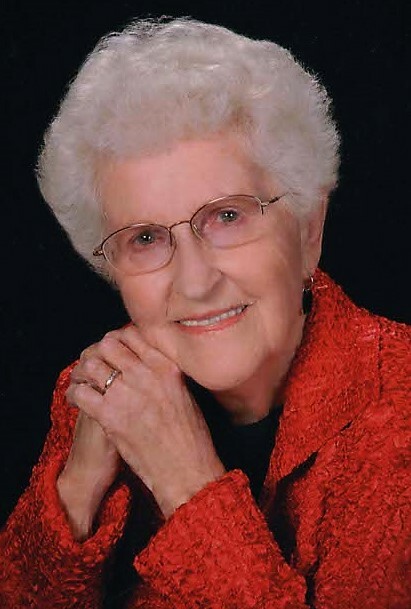 Obituary for Gladys Louise (Darche) Moehring | Hondo Funeral Home, Inc.
Gladys Louise Darche Moehring, age 96, crossed over on Friday, January 11, 2019 in Hondo, Texas. She was born on July 27, 1922 to James and Valsorine Darche in Topeka, Kansas. During her childhood years, she lived in numerous states due to her brother’s health. Gladys graduated from Fox Tech in San Antonio in 1940. Upon completion of Secretarial School, she was employed as a civil servant at Kelly Air Force Base in San Antonio throughout WWII. Through shared friends, Gladys met Harold Moehring of Hondo. Their relationship continued to grow during WWII while Harold, who was in the Coast Guard, served in the South Pacific. After the war they were married on October 25, 1946, at her parents’ home in San Antonio. Gladys was a homemaker, caring for their two daughters and Harold until 1963. She added to her duties when they opened Moehring’s True Value Store, working full time until she and Harold retired. Through the years, Gladys was a leader in her daughters’ P.T.A. organization, served on several church committees as well as a church councilwoman. She was a member of the first Hondo Development Board. Upon retirement from the store, she helped Harold raise Beefmaster Cattle and loved spending time around her grandchildren and great grandchildren. During her lifetime Gladys put others first. Her smile and sweet nature will always be remembered as will her sense of humor. She is preceded in death by her parents, husband, brother, and brother-in-law. Survivors include daughters, Sherrill (Henry) Nester and Lyn (Larry) Muennink both of Hondo. Four grandchildren, Jason (Heidi) Nester of Denver; Erin (Ferro Trabalzi) Nester of Rome, Italy; Brian (Melissa) Bauman of Liberty Hill, Texas; and Nicole (Eric) Lindsey of Katy, Texas. Eleven great grandchildren and sister-in-law Virginia Jenkins.